With certain textile PU coating processes solvent is used or even combinations of solvents. For the removal of the solvent gas emissions, the companies use air purification techniques like scrubbers, rotor concentrators and post combustion. In cases where the gas streams have a medium or high load, the efficiency of current technologies is not high enough to reduce the solvent to the required minimum concentrations. The textile coating companies in Flanders are subjected to stricter controls, by the regulation agencies, compared to competitors outside Flanders. 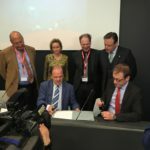 The companies need a robust, reliable and efficient emission gas treatment to be combined with their current technique to secure their operations in Flanders. A feasibility desktopstudy was already performed. This study screened 16 technologies for this use and concluded that 6 technologies show potential to meet the screening criteria: compatibility with running production systems and installations, (expected) effect and efficiency on removal of solvent, ecological and economical sustainability and “user friendly” (working conditions for operators, etc). The overall goal of this project will be to tackle persistent issues in the use of the solvent in polyurethane coating applications. The main, short term development will consist of pilot scale solvent emission reduction. The secondary, longer term goal comprises the development of new, sustainable solvents for PU dispersions and coating processes to replace the current solvents while striving to preserve existing coating infrastructure. There is no knowledge gap in the project. No additional partners are required. This document is a notification of a new project. Please contact Leentje Croes (lcroes@catalisti.be, +32 472 889 776) if you have questions concerning this notification.